There were a lot of reasons that I loved Rachel Marie Stone’s de(tale) about the wedding dishes she was finally unpacking. It was a luminous, beautifully-crafted piece, but it wasn’t just the beauty that nudged the tears out of my eyes and down my cheeks. It was the promise of a similar moment, for me, not long down the road. For years I’ve been buying housewares that I love at yard sales and thrift stores and on sale at Anthropologie. Though there were missteps along the way, I managed to accumulate the makings of a fairly functional kitchen. Granted, when I last thought about moving out, I owned a lemon zester and no sharp knives (now I own sharp knives and two lemon zesters! ), but I had a few bowls, a few plates, lots of mugs. I moved into a new house on Saturday morning. I loaded all of my tightly-packed hope into the smallest-sized Uhaul and joined the other hands who were helping bring it to fruition, one armful at a time. On Sunday, having got many of the pressing concerns under control, I directed my attention to the kitchen. I was alone in the house, and I welcomed the warm water running over my hands and the scent of dish soap in the air as I started to wash my newly-unpacked treasures. I hope to never underestimate the spiritual practice of doing dishes. I sorted through the cupboards, wiping out drawers and organizing, washing as I went. I rearranged the glasses and mugs, enjoying the way my mugs mingled with those of my roommates. They were distinct, and yet, it was amazing to see how they belonged, already. I handled each bowl and plate and glass. As I did, I thought about the places these dishes had come from. I found yard sale stickers on several pieces, and it took me back to that moment in time. I remember being that girl who saw a future that didn’t yet exist. 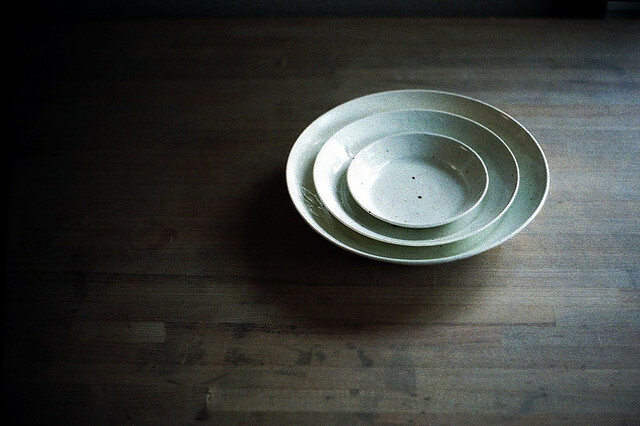 I remember the feeling that these dishes belonged in my kitchen, distant though it seemed. My legs are sore from the constant movement. My hands are dry and tight from the hot water. But if you were to come over, I would show you my kitchen with joy, inviting you to poke around in cupboards and peruse my shelves. I would make you a cup of tea and set it in front of you. I would tell you that you were drinking from a cup of hope.